[Moore]: Fascism is like a hydra — you can cut off its head in the Germany of the ’30s and ’40s, but it’ll still turn up on your back doorstep in a slightly altered guise. 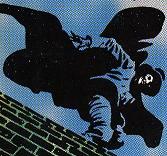 … “V for Vendetta” has had an annoying way of coming true ever since I wrote it in the early ’80s. Back then, I wanted something to communicate the idea of a police state quickly and efficiently, so I thought of the novel fascist idea of monitor cameras on every street corner. And the book was, of course, set in the future of 1997. But by that year — and I don’t know if Tony Blair and Jack Straw were big fans, but evidently they thought its design for future Britain was a really good one — we had cameras on every street corner along the length and breadth of the country. I always felt that, Moore’s vision of the dystopia aside, that his character’s reaction to it—the “vendetta” of the book’s title—was profoundly unsatisfying when you got right down to it. I wonder whether this is a reflection of the sense I have that the book is trapped in British history. The first volume opens with echoes of Guy Fawkes, who is today celebrated for failing to change the order of the world in his attempt to bomb Parliament, and V’s methods don’t really move past that (except directly to murder). There’s no vision for change beyond the ending of the current order and the placing of the people’s fate in their own hands. I guess that Moore’s point was that it should end there, that solving the problems needs to be done by the people rather than by some narrator or revolutionary. Condolences to the Cathy Woolard campaign. I guess whatever else you can say about Georgia politics, the state is never boring and never predictable.